It arrived this week. Reading it so far I’ve felt nostalgia and had a sense of revelation. 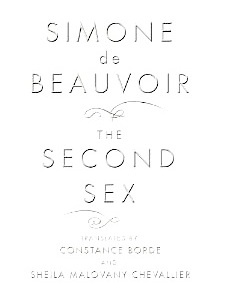 The new translation does seem so different to the one I read in my late teens tho I can’t be sure without going back to the original translation if it was because I approached it differently as a younger woman or if it was the nature of the translation that made Simone de Beauvoir seem so different to me now. Whatever the reason I find her writing much more approachable, more appealing to engage with rather than be lectured by and her long winding sentences seem personal and thoughtful rather than impenetrable. Focusing on the question of ‘what is a woman’ in the introduction, Beauvoir identifies what an elusive term it is, that really only makes sense in contrast to the term ‘man’.. Yet there is something more absolute about man that doesn’t require definition in the same way. ..if we accept, even temporarily, that there are women on the earth, we then have to ask: what is a woman? Woman…determines and differentiates herself in relation to man, and he does not in relation to her; she is the inessential in front of the essential. He is the Subject, he is the Absolute. She is the Other. I have always been very aware of this sense of being the ‘Other’ that ‘man’ is somehow the fixed standard against which woman is compared, contrasted and defined. Even when it comes to films I want to watch being dismissed as ludicrous for men to be expected to watch while the films they choose are considered generic and therefore I am expected to join in. How is it then that between the sexes [this] reciprocity has not been put forward, that one of the terms has been asserted as the only essential one, denying any relativity in regard to its correlative, defining the latter as pure alterity? Why do women not contest male sovereignty?…in order for the Other not to turn into the One, the Other has to submit to this foreign point of view. Where does this submission in women come from? There have not always been proletarians; there have always been women; they are women by their physiological structure; as far back as history can be traced they have always been subordinate to men; their dependence is not the consequence of an event or a becoming, it did not happen. Alterity here appears to be an absolute, partly because it falls outside the accidental nature of historical fact… If woman discovers herself as the inessential, and never turns into the essential, it is because she does not bring about this transformation herself. Proletarians says ‘we’…Posting themselves as subjects, they thus transform the bourgeois [or whites] into ‘others’. Women – except in certain abstract gatherings such as conferences – do not use ‘we’; men say ‘women’ and women adopt this word to refer to themselves; but they do not posit themselves authentically as Subjects. The division of the sexes is a biological given, not a moment in human history. Their opposition took shape within an original Mittsein and she has not broken it. The concept of Subject and Other and Mittsein I know play a big part in Beauvoir’s writing and I do think there is something in how she portrays woman that is useful to work with. It’s easy to dismiss some of the things she says about women’s position in society because things have changed. But I am interested in to what extent women’s position in relation to themselves and to men has changed… can women say that they have taken the difficult path towards freedom? Are they (am I?) still in some ways accepting the position of the Other because of the benefits it brings? At the moment that women are beginning to share in the making of the world, this world still belongs to men: men have no doubt about this, and women barely doubt it. Refusing to be the Other, refusing complicity with man, would mean renouncing all the advantages an alliance with the superior caste confers on them. Lord-man will materially protect liege-woman and will be in charge of justifying her existence; along with economic risk, she eludes the metaphysical risk of a freedom that must invent its goals without help. Indeed, beside every individual’s claim to assert himself as subject – an ethical claim – lies the temptation to flee freedom and to make himself into a thing: it is a pernicious path because the individual, passive, alienated and lost, is prey to a foreign will, cut off from his transcendence, robbed of all worth. But it is an easy path: the anguish and stress of authentically assumed existence are thus avoided.